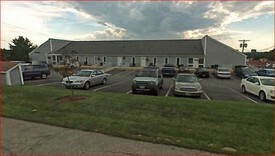 Our office is located at the corner of Auburn and Canton Streets in the CYPRESS MEDICAL PARK. We are in Suite #12 located in the upper level of the first building across from the Elliot Hospital's Emergency Room/Trauma Center entrance. FROM THE SOUTH: Take Exit 6 off I-93/101 East. Take a left onto Candia Road for one mile. At the light, take a right onto Mammoth Road. At the second light, take a left onto Lake Avenue. Take the third left onto Canton Street. FROM THE NORTH: Take Exit 8 off I-93. At the end of the ramp, take a right onto Wellington Road/Bridge Street. At the next intersection, take a left onto Mammoth Road (28A). At the second light, take a right onto Lake Avenue. Take the third left onto Canton Street.